A negative stock photo, treated with humor, can often prove to be a successful image. My best selling image last month has been online for two years with barely a sale. It is a perfect example of the strength, and weakness, of a Rights Managed image. 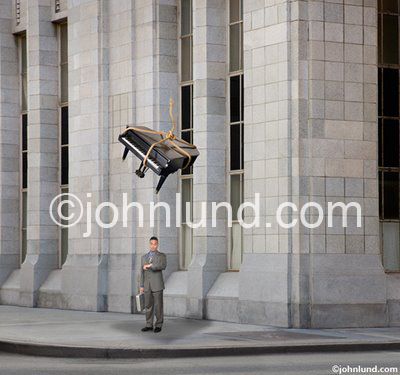 The picture, a piano about to fall on the head of an unsuspecting businessman, is clearly a negative one, and we all know that negative images do not sell as well as positive ones. Nonetheless, I was pretty sure it would sell often. It can be used to advertise a number of concepts from preparedness, to risk, to the future, to the need for insurance. On the positive side this image also employs humor, a quality that I have found to be a very positive attribute in terms of sales potential. Yet after two years it has only been licensed twice, and each time for very small amounts, until this last month when Getty Images licensed it to a client for over $7,000.00. My share was 40%. Not bad…and hopefully not the last license either. Actually, my experience tells me that I will wake up one day and see that the fees I have earned will be quite considerable. Keeping in mind that I am a hopeless optimist, I fully expect these types of concept images to earn fees in the $10,000 range over a period of seven to ten years. 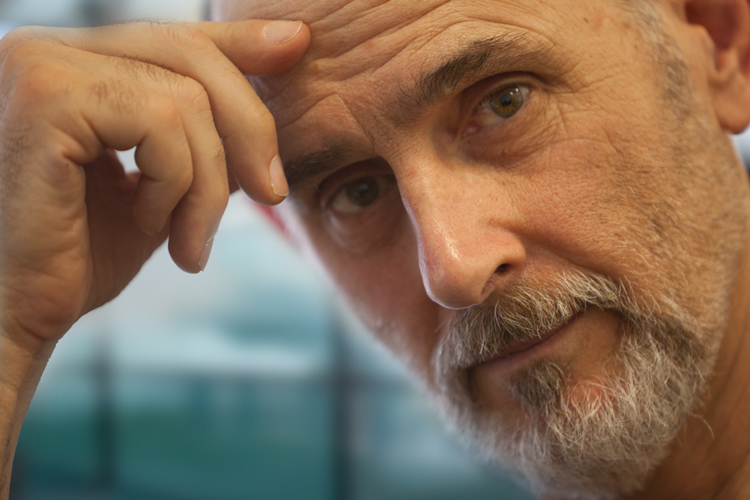 Of course, that is probably mostly wishful thinking…but hey, it is that kind of thinking that keeps me going…and here I am after all these years still earning a comfortable living off of stock photography. This is one of a number of images that I have created that linger for years without any significant earnings until, out of the blue, they earn a bunch of money. Rights Managed images are like the lottery in that respect. But do you want to count on the lottery for making a living? I sure don’t. But I sure like it when I win. Rights Managed images have a smaller audience, a much smaller audience. When one looks at the big picture of stock photography it is painfully obvious where things are headed. Lower prices for a bigger audience are the order of the day. And yet, in the case of this particular image, the potential licensing audience is relatively small. Just because rights managed images have a small audience doesn’t mean they can’t sell multiple times…they often do. In fact, for some uses, Rights Managed images can cost less than Royalty Free images. The fact that this image has not sold numerous times, in fact only three times in two years, indicates that the wider audience of RF images would still not have resulted in financial success (I am guessing here). It would seem that putting this particular image into the Rights Managed category was the right thing to do. My conclusion here is that though imperfect, a strategy of placing appropriate images into appropriate licensing models is a good one. I might add that when I mine my royalty reports for useful information it always seems to me that whether a great image will sell well in either category…but some do better in one or the other. If I were a microstock shooter I would try and add some RM imagery into my business. I believe that in the stock photography business, as in the stock investment business, diversification is a good thing…and strategic diversification is even better. As it is, I hope that more of my RM and RF images get placed in front of microstock audiences. Ultimately the formula for success in stock photography is to have great images, at appropriate prices, in front of everyone.